Combinations of commonly used drugs - for conditions such as heart disease, depression and allergies - have been linked to a greater risk of death and declining brain function by scientists. The researchers were investigating medicines which affect a chemical in the brain - acetylcholine. The neurotransmitter is vital for passing messages from nerve cell to nerve cell, but many common drugs interfere with it as a side effect. Eighty drugs were rated for their "anticholinergic" activity: they were given a score of one for a mild effect, two for moderate and three for severe. Some were given by prescription only, while others were available over the counter. Dr Chris Fox, who led the research at the University of East Anglia, said: "Clinicians should conduct regular reviews of the medication taken by their older patients, both prescribed and over the counter, and wherever possible avoid prescribing multiple drugs with anticholinergic effects. She told patients: "The first thing is not to worry too much, the second thing is to discuss it with your doctor or the pharmacist, and the third thing is do not stop your medicines without taking advice first." He said the use of anticholinergic drugs had "probably increased as more things are being treated and more drugs are being used." 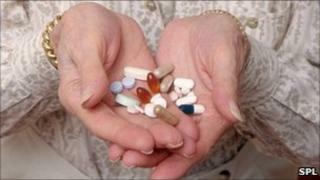 The drug Aricept is given to some patients with Alzheimer's disease to boost acetylcholine levels. Dr Susanne Sorensen, head of research at the Alzheimer's Society, said a 4% drop in brain function for a healthy person would feel like a slow, sluggish day. "If you are at a level where one little thing pushes you over into confusion, then that is much more serious," she added. "However, it is vital that people do not panic or stop taking their medication without consulting their GP." Rebecca Wood, chief executive of Alzheimer's Research UK, said: "This comprehensive study could have some far-reaching effects. The results underline the critical importance of calculated drug prescription."